Seeing ghosts have fascinated people for centuries. This book applies the use of latent images on the retina of the eye and the phenomenon that latent images will sometimes show up on a blank page as the color opposite. This book contains a collection of colored images. 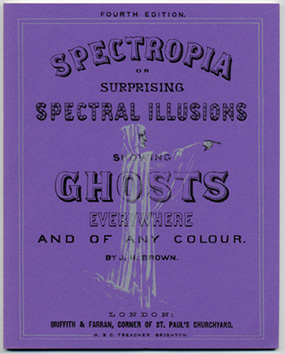 To make the spectres appear, you place the image in a bright light, stare at it for a while, and then usually look at a plain white background. What appears is a "negative" image of the picture on the page. For example, if the picture is orange, the image on the white background will appear blue. The only exception to looking at a plain white background is when the picture is black. Then you would look at a black background and a white image will appear. Though not included in the book, you could produce a similar effect by making a US flag with green and black stripes, an orange field, and black stars. You stare at this flag for a short while, and then you look at a white background. What will appear is a red, white, and blue flag. 11 pages of text plus 16 color images. Paperbound.